NUREMBERG, Germany--(BUSINESS WIRE)--Bringing unprecedented design flexibility to the 32-bit market, Silicon Laboratories Inc. (NASDAQ: SLAB), a leader in high-performance, analog-intensive, mixed-signal ICs, today introduced the Precision32™ microcontroller (MCU) family. Based on the ARM® Cortex™-M3 processor, the new Precision32 family includes 32 SiM3U1xx and SiM3C1xx MCU products with footprint-compatible USB and non-USB options. Offering a highly integrated, flexible architecture, a rich peripheral set, ultra-low power and Eclipse-based development tools that are downloadable at no charge, the Precision32 family is suitable for a wide range of applications including portable medical devices, point-of-sale peripherals, motor control, industrial monitoring, barcode scanners, optical touchscreen interfaces, sensor controllers and home automation systems. Integrated precision oscillators with an advanced phase-locked loop (PLL) eliminate the need for a costly 8 MHz crystal by providing the clocking accuracy necessary for crystal-less USB operation while running the core independently at any frequency from 1 to 80 MHz. An internal 5 V voltage regulator enables the MCU to be powered directly from USB or a 5 V source without the need for an external regulator. Six high-drive I/Os (up to 300 mA each) can directly drive high-power LEDs, small motors, buzzers and power MOSFETs, as well as serve as a boost converter controller. Up to 16 capacitive touch channels eliminate the need for separate touch sensor ICs in applications requiring buttons, sliders or wheels. The Precision32 family offers a complete USB 2.0 PHY and analog front-end interfacing directly to the USB connector, while most other MCUs require an external USB pull-up resistor and termination circuit. With design schedules compressing to meet aggressive time-to-market goals, today’s embedded developers tackle complex and often rapidly changing design requirements while meeting stringent cost and power budgets on tight deadlines. Many current 32-bit MCU products lack sufficient architectural flexibility, especially for pinout and peripheral placement, which makes the design job harder than it has to be. The Precision32 family offers developers a more flexible alternative by providing a fully customizable I/O system and pinout arrangement. Using Silicon Labs’ patented dual-crossbar technology and a drag-and-drop GUI, developers can easily choose their analog and digital peripherals and pin locations for these peripherals. Competing MCUs often have preset peripheral locations and pinouts, leading to pin conflicts that force developers to alter their designs or move to larger, costlier packages. Silicon Labs’ crossbar design and GUI-based AppBuilder software enable developers to optimize their peripheral mix and pinout placement and locate peripherals near connecting components, thus eliminating pin conflicts, simplifying PCB routing, minimizing PCB layers and ultimately reducing system cost. The Precision32 family’s analog peripherals are specified and tested to operate over temperature and voltage (down to 1.8 V). In fact, these high-performance analog peripherals are so reliable they can replace standalone analog components. Moreover, the Precision32 analog peripherals are highly configurable, enabling developers to simplify their designs and optimize performance for a wide variety of embedded applications. Silicon Labs engineered the Precision32 family to achieve industry-leading power efficiency in both active and sleep modes. The MCUs leverage Silicon Labs’ state-of-the-art, patented low-power design technologies to achieve power reductions within every block of the MCU design, resulting in up to 33 percent lower active current (22 mA at 80 MHz or 275 µA/MHz) and 100 times lower sleep current (0.35 µA with RTC enabled and 4 kB of RAM retention) than competing 32-bit solutions. Numerous power modes and clocking options enable developers to optimize their embedded designs for the lowest power at a given performance level. To streamline the development of embedded applications based on the Precision32 family, Silicon Labs offers a rich set of hardware and software tools including a unified development platform (UDP) featuring interchangeable MCU and radio components and other subsystems designed to match each developer’s application needs. The UDP includes a single motherboard, modular plug-in boards, and ample room for prototyping, expansion and system integration. It also supports MCU code and firmware development and an array of network and protocol stacks and USB drivers. To accelerate sub-GHz RF design, Silicon Labs offers RF test cards for the UDP that support the company’s new Si446x EZRadioPRO® transceivers. Silicon Labs’ complimentary Eclipse-based integrated development environment (IDE) includes a compiler, debugger and an online dashboard for application-critical information such as a software library with example code, data sheets, schematics, PCB footprints, app notes, active version tracking and automatic updates. A centerpiece of the IDE is Silicon Labs’ GUI-based AppBuilder software, which enables developers to quickly and graphically select their peripheral mix and properties, set up clocking modes, customize pinouts and generate source code – all without having to write a line of code or read a data sheet. The Precision32 family also enables developers to take advantage of the huge ecosystem of software and development tools optimized for the ARM architecture including Keil and IAR tool chains. To accelerate development and code porting from competitive MCU platforms, Silicon Labs offers Cortex Microcontroller Software Interface Standard (CMSIS) compliant code. ARM software interfaces for common peripherals enable peripheral driver re-use and simple porting from other ARM-based MCUs. 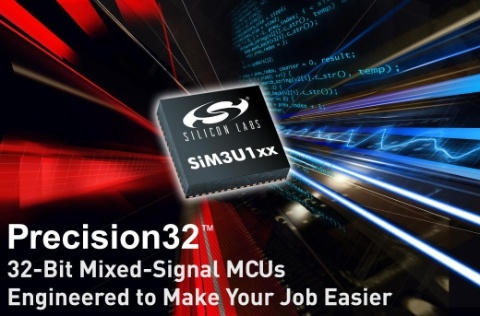 Production quantities of Silicon Labs’ Precision32 MCUs are available now with flash sizes scaling from 32 to 256 kB and in five leaded and leadless package types, ranging from a 6 mm x 6 mm QFN-40 for space-sensitive applications up to an LGA-92 for maximum I/O configurations. Product pricing in 10,000-unit quantities begins at $2.20 for SiM3C1xx non-USB MCUs and $2.68 for SiM3U1xx USB MCUs (prices in USD). Future products in the Precison32 family will include additional 32-bit MCU products that take power conservation and precision analog performance to new levels. Silicon Labs’ UDP hardware tools include economical SiM3U1xx-B-DK and SiM3C1xx-B-DK development kits available for $99 (USD MSRP). The SiM3U1xx-B-EDK and SiM3C1xx-B-EDK enhanced development kits featuring I/O expander cards and additional demos to enhance the development experience are priced at $349 and $299, respectively (USD MSRP). Silicon Labs’ customers can download the Precision32 IDE software tools from the company’s web site at no additional charge. For additional Precision32 product information, samples and development tools, please visit www.silabs.com/pr/32bit-mcu. Note to editors: Precision32, Silicon Laboratories, Silicon Labs, the “S” symbol, the Silicon Laboratories logo and the Silicon Labs logo are trademarks of Silicon Laboratories Inc. All other product names noted herein may be trademarks of their respective holders.